For this installment of my Starlet Series on Youtube, I took advantage of my newly bobbed hair to create a style inspired by Anna May Wong in the 1922 film, The Toll of the Sea. I was unfamiliar with the movie prior to my viewing it for this series, and I'm so glad I saw it. 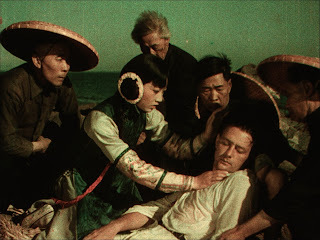 It's a fantastically preserved piece of film making and was shot entirely in early technicolor-something very rare for this early period in cinema. The movie clocks in at only an hour and is available on YouTube in its entirety so do yourself a favor and give it a few minutes of your time! The story follows Anna May Wong (in one of her first starring roles) as Lotus Flower, a lovely Chinese girl who falls inlove with a young sailor who is washed upon her shores after a shipwreck. The couple begins a life together and to sweet and gentle Lotus Flower, their union is nothing less than a marriage. However for the young man, though he promises Lotus Flower that he intends to take her home to the states when he returns, fickle feelings begin to surface and his friends influence him to leave her behind. 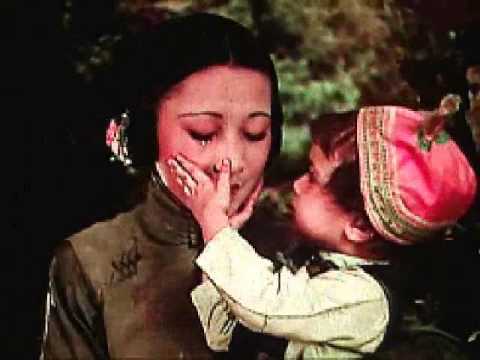 Time passes and young Lotus Flower is now a mother who anxiously awaits the return of her 'husband', whom she refuses to believe would abandon his wife and child. When Carver (the young man, played by veteran actor Kenneth Harlan) is finally persuaded to return, he has an American wife who is not unsympathetic to the girl's plight and tries in vain to assist her in any way possible. Tragedy ensues as Lotus Flower takes matters into her own hands. If the story sounds familiar, that's because it is a variation of several other traditional tales. The Little Mermaid comes to mind...so does Madame Butterfly. But in spite of the well known storyline, the movie still holds impact due to the memorable performances of Anna May Wong and Beatrice Bentley (who plays the American wife)as well as the stunning technicolor. The rest of the cast is not particularly memorable but the direction moves the story along at a brisk pace and doesn't fail to keep you interested. 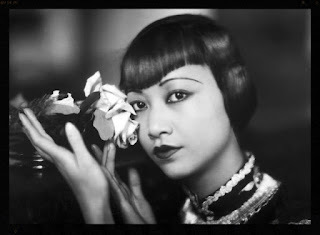 For this look, I took inspiration from the simple hair from the film as well as the makeup from a few promotional shots of Wong, around this time period. Due to the color of the film, I thought in muted tones instead of black and white, and filmed the video that way. Purple hues make a lovely option for this sort of look so that's another great option for you to individualize this one. The makeup application calls for a flawless complexion that has a little youthful vitality. Highlighting primers and creams work best to add a little sheen without any shimmer. The eyes feature thin, straight brows and are intentionally slanted and catlike. In this case, eyeshadow is utilized over liner to bring softness to the look. View the video below and feel free to ask questions about products and placement in the comments. For a primer, I used my favorite Clinique Moisture Surge, which keeps full coverage foundation from ever having a cakey or chalky appearance. Under my eyes, I used the Hydrating Under Eye Primer by Smashbox. This not only prepares the eyes for concealer but also brightens quite a lot. 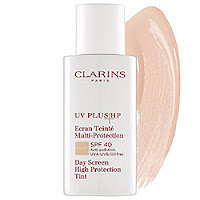 Using my Beauty Blender, I applied the Clarins UVPlus in the light tint. This provides significant coverage that can be built upon. I followed this up with another foundation, the Napoleon Perdis Shear Genius Foundation, which gives the face a flawless but luminous quality. Next, I began on the eyes, using my Cover FX cream to conceal beneath my eyes, but also at the outer corners, to lend a more upturned look to them. The eyeshadows I used are by Stila and Two Faced but again, not brand specific. Go with any shimmery neutrals in your collection or colors that will keep that bright look at the forefront. 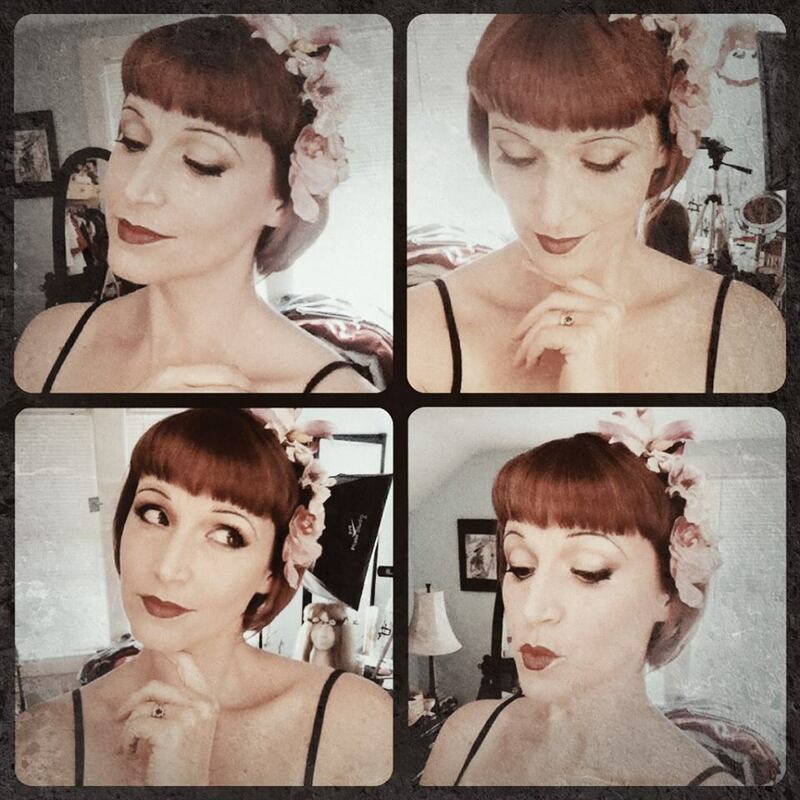 Smudgy pencil liner, dark minimized lips, and no blush are all that's left to characterize this early '20's look. As always, I set the whole thing in Dermablend Original Setting Powder and press my powdered face with my hands to keep the finish of my foundation and prevent it from looking too dry or matte. Hair is simple and self explanatory when you watch the video. 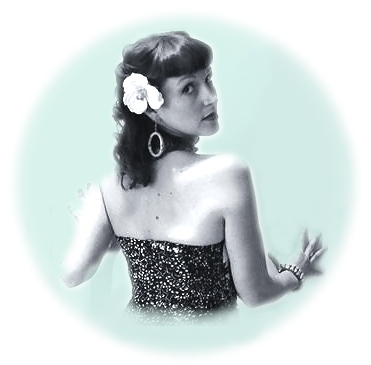 The only product that I strongly recommend is a shine product, to finish out the style with movie-star glamour! As always, let me know if you have any questions about this or any of my tutorials.